Remember last week I showed you the big hat and the little hat? Well ta-dah! For now I will leave you with a picture of our home-grown chilli, which has been slowly turning from green to red over the last couple of weeks. Bit random I know, but I think it pretty much sums my day up.....watching the rain from inside. 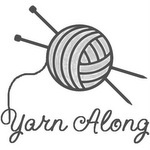 I am joining in with the yarn along again this week as loved seeing what everyone had been making!